Outlined below is a brief review and history of the Subaru BRAT. This includes unique features and various naming conventions. At the bottom of this page the BRAT in pop culture is discussed. The BRAT is a four wheel drive utility coupe based on the Subaru Leone sedan that was first introduced in 1971. The President of Subaru of America requested the development of the BRAT in 1977 for model year 1978. The original idea was to compete with similar vehicles of the time including the Chevrolet El Camino and Ford Ranchero. It was also brought to market in response to the rise in popularity during the late 1970s of small import pickup trucks from Toyota, Nissan and Mazda. The term BRAT is actually an acronym derived from the longer more formal title Bi-drive Recreational All-terrain Transporter. Which was of course an attempt to describe the concept and purposed implementation of the vehicle. A very unique design element of the US versions of the BRAT was that there was carpeting in the rear cargo “truck bed” area along with rear-facing “jumpseats” that were welded in. This differed from its contemporaries that had more of a truck bed style rear with a steel stock liner and no formal seating. The design was not really for originality though; considering the seats were plastic it was basically a way for the BRAT to avoid the Chicken Tax – a 25% tariff imposed by President Johnson in 1963. Instead of the 25% tax on import light trucks the BRAT was able to skate by with a mere 2.5% tariff due to its classification as a passenger car. The cost however was reduced cargo area and unsafe seating that resulted in serious injuries during accidents. The rear jumpseats were discontinued after the 1985 model year. 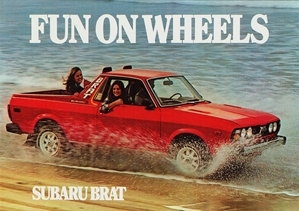 The Subaru BRAT was given many different names depending on the variation or market for which it was being sold in. Listed below the variations. After being introduced in 1978 the BRAT had major redesigns in 1982 and 1985 but import into North America was discontinued soon after in 1987. Production continued until 1993 for imports into Australia, Europe, South America and New Zealand. 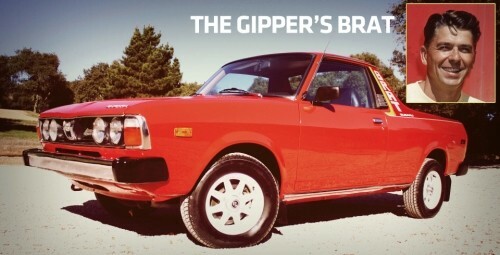 Despite Subaru being a Japanese owned and operated company, the BRAT was never sold in Japan.